Still worried about the new youthful face of our beloved Time Lord? Well fret no more. Here are the first pictures of The Doctor fully regenerated, dressed up, and ready for your keen eye. How about that bow tie? Also, are those pants TIGHT ROLLED at the bottom? I fear that the new Doctor may be . . . a hipster. Then again, it always takes me an episode or two to warm up to the new face of the Doctor. New companion Amy Pond (played by Karen Gillan) is stop-in-your-tracks gorgeous, she's certainly giving Rose a run for her money. Here's a bigger and better picture of the two. 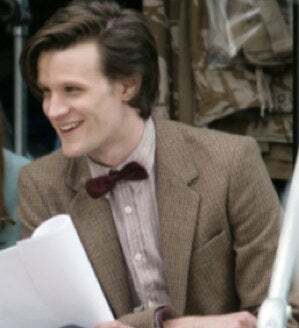 It's Matt Smith's first day on set and the two have been filming the episode titled "Come Alive."